This week I criticized Donald Trump for chanting “lock him up” in reference to George Soros, just days after one of Trump’s own biggest supporters tried to assassinate Soros. This led some to ask the question of why I keep calling for Trump to be imprisoned, even as I criticize Trump for calling for others to be imprisoned. It’s a good question, and I can give you a great answer. Donald Trump is currently under criminal investigation by the FBI and the Attorney General of New York for a list of alleged felonies a mile long. Moreover, Trump has committed several of these crimes in plain sight on his Twitter account (witness intimidation and obstruction of justice, for instance), or committed them on live national television (attempting to conspire with Russian hackers against the United States during the debate). Trump is guilty of several felonies. Based on sentencing guidelines for the crimes he’s committed, when he’s finished being brought to justice, he’s looking at a prison sentence of hundreds of years. So when I call for Donald Trump to be locked up, it’s because he’s an actual criminal who has committed actual crimes. This stands in sharp contrast to when Trump called for George Soros to locked up this week without even bothering to accuse Soros of a crime. He’s seeking to lock up a man he knows is innocent, simply out of political retribution. Similarly, when Trump calls for Hillary Clinton to be locked up, he’s basing it on false accusations that she somehow broke the law with her use of email, even though the Republican-controlled FBI long ago fully cleared her of any possible wrongdoing. I would never call for a political figure to be thrown in prison simply because I think that particular individual is bad for the country. I have a very low opinion of Ted Cruz, for instance, but I wouldn’t call for him to be locked up, because I’m not aware of him having committed any felonies. 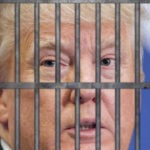 I’ll keep calling for Donald Trump to be locked up because he’s a career criminal who has confessed to numerous felonies, and is obviously guilty of many other felonies. That’s the precise opposite of Donald Trump calling for Hillary Clinton or George Soros to be locked up when he knows they’ve committed no crimes.